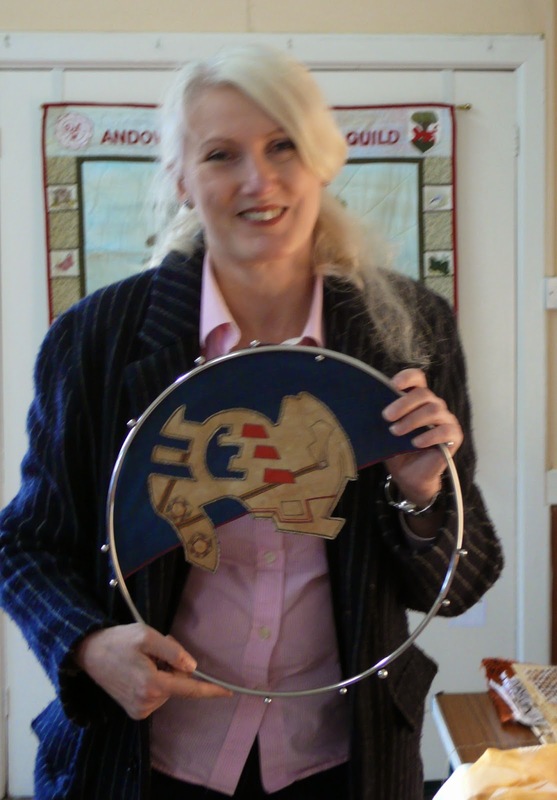 Textile Artist Anne Griffiths gave us a fascinating talk on Monday (20 April 2015) on her involvement with Diamond Light Source. Diamond Light Source is the UK’s synchrotron, located at Harwell Science and Innovation Campus in Oxfordshire. The synchrotron works like a giant microscope, harnessing the power of electrons to produce bright light that scientists can use to study anything from fossils to jet engines to viruses and vaccines. As part of a community project, funded by the Wellcome Trust, the Women's Institute was approached to create an embroidery for the Diamond Light Source. Under Anne's guidance, over 1000 scientists and members of the WI contributed to the art project, called Designs for Life. 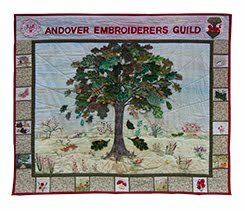 Originally the idea was to have an embroidered panel measuring 30 metres, however, in the end, thirty individual panels were created, each measuring 50 cms x 50 cms. This allowed as many people as possible to take part and also meant that the work would be easy to move and could be displayed separately or together. The panels depict diseases such as HIV, Alzheimer’s and breast cancer, as well as iconic scientific images such as diffraction patterns, a DNA fingerprint, and even a synchrotron. As part of the design process, certain rules were drawn up. For example, participants were asked to use specific fabrics - silk, organza, cotton, calico, silk velvet or scrim. Each panel had to contain 80% of one of these fabrics and 20% could be the stitchers' own style. 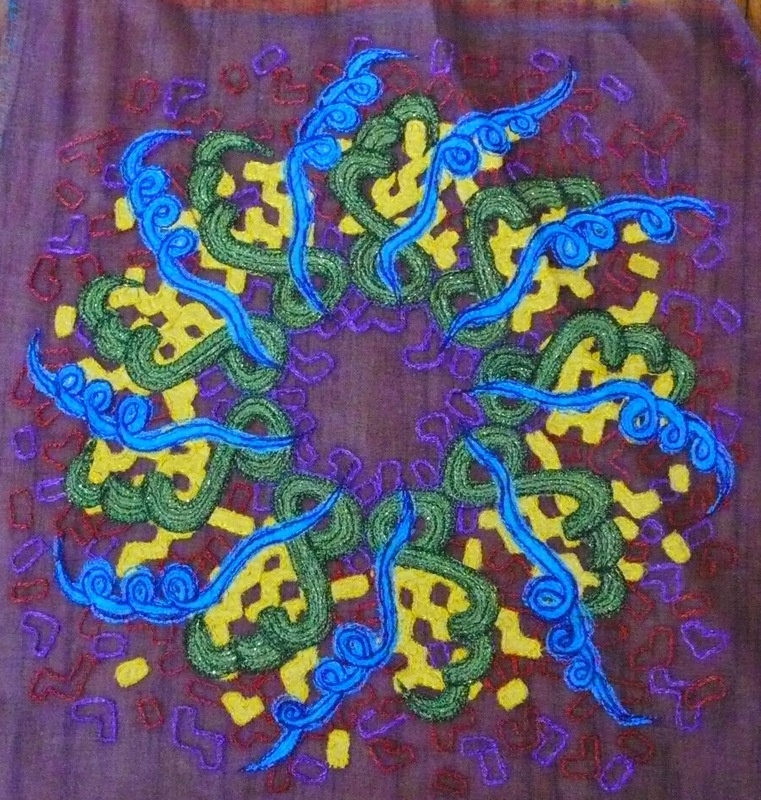 The finished embroideries contain many different stitch styles, including embroidery, knitting, crochet and patchwork. Her Majesty The Queen opened the exhibition and Anne presented the Queen with one of her own embroideries, doubtless currently hanging in Buckingham Palace! 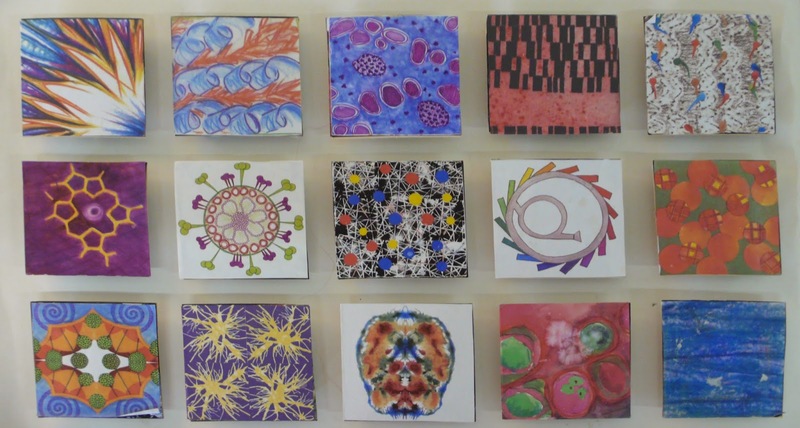 The Designs for Life textile panels remain on exhibition at Diamond Light Source and will be available to view at the large Harwell Campus on open days in July. Anne went on to talk about some of the other projects she has been involved with, including the Mary Rose Trust and the Natural History Museum. Anne also runs a distance learning course for machine embroidery and Nicky, one of our members, completed the course last year and met Anne for the first time on Monday. Many thanks Anne, for a very enjoyable evening. Not only was your talk very stimulating but made us realise that inspiration for design can sometimes be found in very unusual places.